Found 3 file extension associations related to MapSys and 2 file formats developed specifically for use with MapSys. 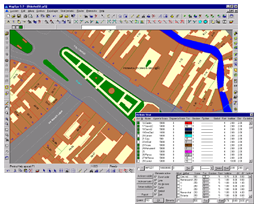 The MapSys Cadastral GIS offers specialized functionality for each stage of processing including the digital map creation, plotting cadastral and topographical plans, generating and combining geo-referenced data in order to obtain a validated relational geo-database. This can be used in MapSys or in other GIS programs or database application. If you need more information please contact the developers of MapSys (Geotop), or check out their product website.